For the first time in a while, Titian Wahyu Club, under the supervision of the centre has organized a cleaning-while-feeding programme around McDonald’s Kota Raya, located at Jalan Tun Tan Siew Sin, Kuala Lumpur. 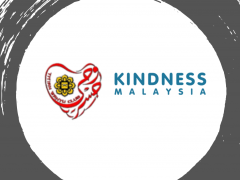 This programme is organized with joint efforts from Kindness Malaysia, a non-governmental association that aims to instill kindness into every living souls on Earth in efforts to make the world a better place and students from the National University of Malaysia (UKM). This community service initiative that focused on cleaning and collecting rubbish around the area, while serving the homeless with food donated by the people. During the programme, participants involved were divided into two, the Cleaning Team; the team that cleansed the area and the Catering Team; the team which their focus was on preparing the food for the homeless. Apart from the intended aim, other purposes of the programme include highlighting the importance of cleanliness of environment and the positive impacts that it can give and to enhance the sense of love and empathy among the volunteers with the people around them – all of which are in line with what the club and the NGO strive to achieve. “Apart from achieving the objectives, the participants also have the opportunities to polish their communication skills through preaching of Islamic values to the people.” said Br Danial Azfar, one of the participants in the programme. At the end of the programme, the volunteers have managed to execute what has been planned by throwing away about 20 plastic bags of rubbish. Breads and drinks were also given away to the homeless, with hopes that it would ease their burden and motivate them to keep having efforts in living and appreciating the life that Allah has given. “There were also recommendations and initiatives planned for the betterment of future programs.” added Br Danial again.